Shalom In The Wilderness: Merry Christmas!! 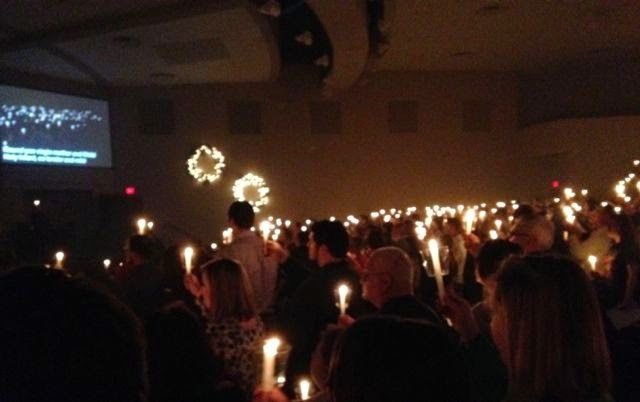 We went to a beautiful candlelight Christmas Eve service last night. I couldn't resist taking a photo. 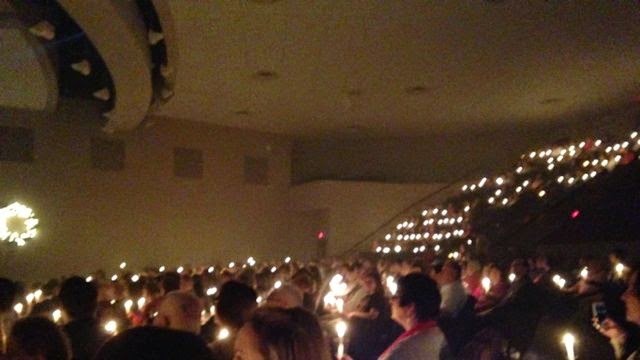 But of course, there is no way to capture the beauty in a photo because part of the reason it was so beautiful was the atmosphere of worship that permeated the place as the candles were lit. Nevertheless, I still wanted a picture to remember. The room was lighted only by candles--a significant lesson in itself--when we consider that as each candle (which represented the light of the world--Jesus--in us) was lit the room became brighter and brighter. We should never consider that we are insignificant. Each light was important and needed to bring the darkness into light! I have attached this wonderful celebratory song of the birth of Christ by the Sidewalk Propthets as my gift to you. I was not familiar with it until last night. As a surprise, David Frey, the lead singer of Sidewalk Prophets was home for Christmas and participated on the worship team. They began the service with this song. I love it! Some People Are So Clever! Our Hometown Christmas was a huge success! From Graham Cooke's "Brilliant News"
What is the Real Cause of Heart Attacks? The Christmas Story--This is Cute!